← In the Social Age, who structures your career? What should you learn? Back from holiday and off to Bulgaria today to deliver a workshop about social learning and community management. I’ve never been to Bulgaria before, indeed, i’d be hard pushed to tell you anything about it whatsoever that went beyond media stereotypes and vague memories of childhood stories. So what do i do? How do i find the ‘sense’ in the Social Age? Periodically it’s worth thinking about how we find the meaning in the world around us (I wrote a short book on this and several articles). 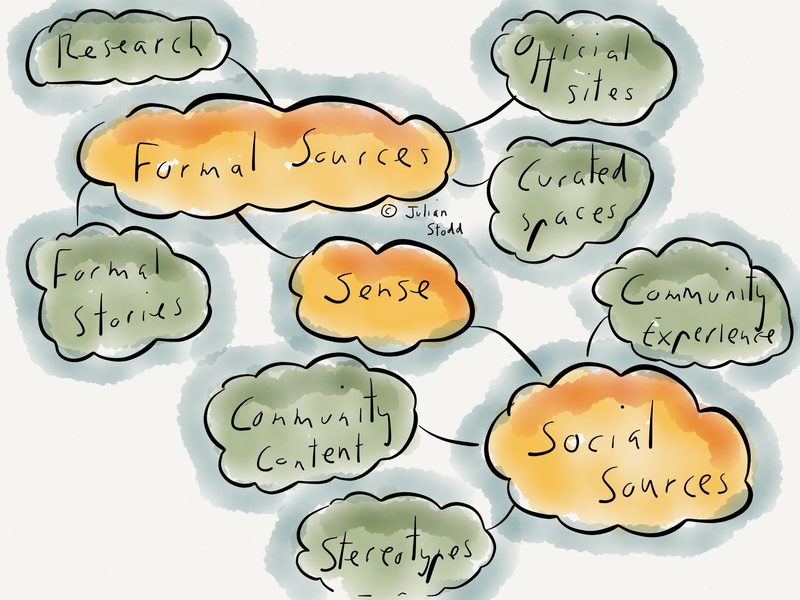 How do we turn to both formal and informal sources in the Social Age and what do we take away from them? Formal spaces are websites and books that are actively curated to tell a story: tourist board sites or books in the airport bookstore. They are ‘official‘ in that they tell a formal story. Social sources are sometimes co-created (like Wikipedia) or formed within our communities (what my friends say on Facebook, LinkedIn or Twitter. If i’m lucky, someone i know will have gone before and can give me some first hand tips (which always carry higher validity if i know that the person is reliable and has good judgement: it’s a function of reputation). Stereotypes are what we fall back on when we have nothing else: they are the culturally and media determined ‘catch all‘ descriptions of a particular culture or people, and they are not necessarily ‘bad‘, as long as we recognise them for what they are. Stereotypes of England probably include the Queen, Beefeaters and EastEnders, all of which are, undeniably, British, but which don’t factor in my everyday sense of self identify and, when push comes to shove, don’t paint a very accurate picture of life in Middle England. So my picture of Bulgaria is emergent: on the coach up (with it’s free WiFi, the staple of the Social Age), i’ve read the Wikipedia page, i’ve checked out a few of the formal curated spaces (for museums) and i’ve reached out to various community sites (unreviewed forums, and my own contacts). My picture is clearly incomplete, but i am starting to create a foundation and skeleton: knowing that Sofia has over a million people living there put is (in my mind) the same size as Birmingham or Las Vegas, much bigger than where i live. Community sites talk about risks to travellers, reinforcing negative stereotypes of mugging and violence. I know these are just that, stereotypes, but until i learn more, it’s hard to discriminate facts from rants and fiction. My picture is incomplete, but at least i know it’s incomplete: i am not basing judgement on it and i continue in the sense making process. Understanding how we make sense, find the meaning in the world around us is important: it’s our everyday social learning approach and we can use this knowledge to inform other types of learning design. Understanding the validity of different sources, understanding their limitations, recognising our over-reliance on stereotypes and calling them out as such, it’s how we learn in the real world. This entry was posted in Community, Culture, Curation and tagged Airport, Books, Bulgaria, Formal Space, Learning, Library, Meaning, Museum, Sense Making, Social Age, Social Learning, Social Space, Sofia, Stereotypes, Wikipedia. Bookmark the permalink.